Jewelry - Zamak Jewelry - Page 1 - Paykoc Imports, Inc.
Our Zamak jewelry line is imported from Turkey. Each piece feels like you hand selected it at a Turkish Bazzar. 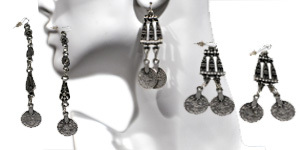 Our line of chic earrings are sure to receive many compliments. From Steampunk earrings to Talisman necklaces we try and find beautiful pieces that you just don’t see every day. Amulets, Chinese symbols, and a line named Celtic Mysteries are among other finely crafted pieces of jewelry that we’re proud to offer and don’t think you’ll see anything quite like it anywhere else. Be unique! You don’t have to wear the same jewelry that a dozen other people bought at the mall on the same day. Our pewter jewelry is made right in our own backyard here in Colorado. This includes the amulets, talismans, Chinese symbols, and Celtic Mysteries collection. Any pewter jewelry we might add in the future will also be from these local skilled craftsman. We also carry the full line of Evil Eye Jewelry that’s been protecting people for generations from the curse of the evil eye. Imported from Istanbul these earrings, necklaces, and bracelets feature the “evil eyes” which provide fashionable protection on the go. 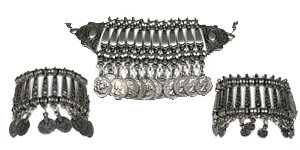 Many pieces are cast in sterling silver and all of them are hand crafted and well made. Don’t forget to check out our copper jewelry offerings as well. 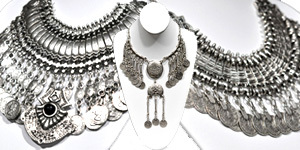 Imported directly from Turkey each piece is hand forged and detailed. Sure to impress and easy on the budget we know our copper jewelry will turn heads and start conversations. We just hope you’re willing to share your shopping secrets with them. If you are a small business owner and love our jewelry as much as we do than we offer great wholesale discounts and options for you. Check out our wholesale page for more details. We also offer customizable options for any of our jewelry. Get them engraved with your company logo (for business use) or with a personal sentiment for everyday use.